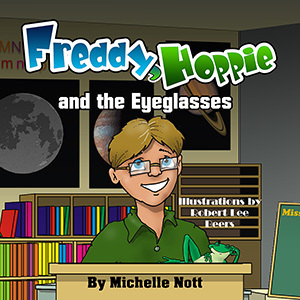 Freddy, Hoppie and the Eyeglasses by Michelle Nott is a great way to help your child adjust his or her very first pair of glasses. Freddy runs late for school, his watch is all blurry, and sometimes his wild answers make his classmates laugh. Using his imaginary friend, Hoppie, Freddy is able to help his mother understand what is going on so she can help. This adorable and funny book tackles an important subject. Sometimes kids don’t want to tell their parents they can’t see the board or the word in a book as clearly as they used to. That can be a frightening thing. Freddy, Hoppie and the Eyeglasses will not only help young people understand it’s okay to share these kinds of problems with their parents; it also shows them how simple an eye exam and getting glasses can be. The vivid colors in Robert Lee Beers’ artwork capture your attention–especially the green. There were a lot of nice background details in these pictures: the tiny apples on the tree outside of the school, the student of the month poster in Freddy’s classroom, and the eye chart in Dr. Virens’ office. This book is a great blend of education and entertainment.